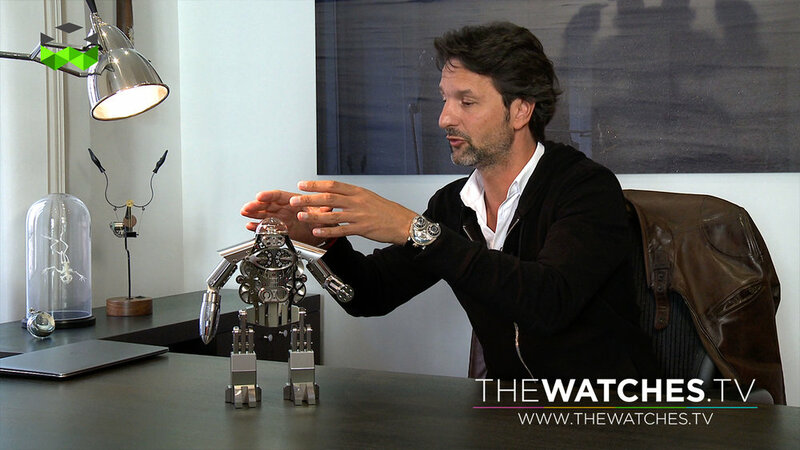 Melchior is the Robot Max Büsser, founder of MB&F, always wanted to have. As an alter ego of R2D2, the robot from Star Wars, Büsser dreamt for years about welcoming a new member like this to his family: Melchior is an elaborate clock with a robot shape. It is manufactured in collaboration with clock specialist L'Epée, based in Delémont, Switzerland. Büsser and l'Epée already collaborated on such clocks as the Starfleet, though Melchior goes one step further in terms of complexity. Indeed, the escapement is actually the “brain” of Melchior and clearly visible through a transparent dome. His eyes move every second and the hours and minutes are displayed by discs on the torso. Melchior is one of the new many new products MB&F is going to launch in honor of its tenth anniversary, following the new motto " A creative adult is a child who survived." No doubt, Melchior is the most creative sci-fi clock on the market at this time, and the funkiest one too!